This book isn’t just about Cass and Leroy being in love before Christmas. Sandy Nathan has done a masterful job in showing us the power of Love-with each other and The One-and how many people find love … by Christmas. Forget the Yule log this winter! 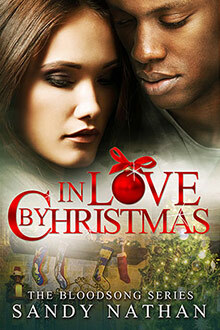 In Love by Christmas by Sandy Nathan puts out a lot more heat. The book pulls the reader in with intriguing characters and an original plot full of twists and turns. In a season that is full of the same old boring stories, it is a great gift to find such a fresh love story. Thanks for the early Christmas present, Sandy Nathan. More like, so much action by Christmas! We meet Leroy back at the rodeo in Las Vegas when he accidentally blew up the bull that was killing his father. He made it to the Retreat and Grandfather, Will Duane fixed the mess with the law and then Leroy is asked to save Will’ s daughter Cass. Grandfather tells him that Cass is his soul mate and so starts a very wild adventure that is so unusual. What did I like? I guess the first thing I liked was Leroy. I fell in love with this kid in the last book and even more in this one. His power is expanding and growing by leaps and bounds, it even surprised him. The other is the author’s writing style, it’s so easy and comfortable to read. What are you going to like? If you have made it to this book you know the background and know what Leroy is up against. Plus this book is going to blow you out of the water it is so over the top with action and intrigue. The characters are most of the same from book two continuing their lives with a few new ones but you’ll love them, quirky and unusual. I can’t wait till the next book. More than the typical guy get girl, or girl gets guy story. You’ll be kept in suspense in the midst of it all. More than the typical guy gets girl, or girl gets guy story. You’ll be kept in suspense in the midst of it all. Not your typical romantic novel. Much more complex than many! As a guy, I just don’t read that much fiction, but I’m glad to have made this exception based on recommendation by a friend. We’re looking at more than romantic twists and turns, passion and frustration. It has a supernatural element, not exactly a Hallmark Channel love story, but still as warm as cuddling before a fireplace on Christmas Eve. Highly Recommended! Riveting on a whole other level. Author Sandy Nahan is truly a Master in the art of storytelling and I have quickly become a fan of her works. Long story short, I’ve been captivated and swept away by the Bloodsong Series. Book three in the series can be read as a stand alone and does not fall short of perfection. From Start to Finish I was enthralled buy the gripping plot theme that seemed to get thicker with every turning of the page. In short, In Love by Christmas made me realize the importance of Christmas from the very root as to where it all started. The backstory is eye-opening and impressive to say the least. There’s Romance, Action, and a bit of wild illumination that will take you away for nights on end. Main characters Will, Leroy and Cass also once again take center stage. They are portrayed in a very descriptive manner that are easy to relate to and get along with. Perfect for my type of red. All-and-all this is an astounding novel that I enjoyed and know that you will enjoy as well. Can’t wait to see what Sandy Nathan comes up with next.